Historical maps are a great resource if you want to learn more about a particular place at a specific time. In addition, some maps include names of people who owned the land, who might even be your ancestors. Use the collections in this category to locate where your ancestors lived and shed some light on the neighborhood and surrounding areas. 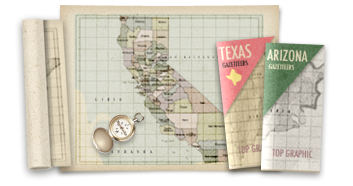 Using maps in conjunction with other sources such as census records might even help to locate some of those "missing people" in your family tree.